Think the spa is just for girls? Think again – because real men need pampering too. Do real men do massage? For years I wouldn’t even have dignified that with an answer. We guys had physio – and unless it was steeped in the heady scent of mud, sweat and Ralgex, the massage table was strictly for girls. Fast forward to my last cruise, and there I am – stretched out, blissed out and putty in the hands of a pixie-sized (but amazingly strong) masseuse. As Holland America’s Koningsdam glides through the waves, I am perilously close to drifting off. How did I get here? Well, it was something of a journey. As travel journalists, my wife Colleen and I have cruised together since our single days. She has always been a spa bunny but for years I’d have none of it. It was too expensive. Too pointless. Too girly. But, Colleen being the persuasive sort, she wore me down. Why not lose my spa-going virginity during the week in Vegas before our wedding? Unable to think of a good reason, I gave in. This being my first time, I was a little vague on the protocol. Directed to the men’s locker room and handed a bathrobe, I was told that I could use the hot tub and any other facilities in the men’s waiting area until it was time for my treatment. It was still early and I had the place to myself, so I wandered about for a bit, sampling the Jacuzzi and helping myself to mint-flavoured water. Not being shy, I’d long discarded my robe. But suddenly, despite the balmy warmth, icy fingers clutched at my heart. Whirlpool baths… flavoured water… this wasn’t right, was it? All it needed was a discarded copy of Cosmo, and I’d be hauled up before Security with a lot of explaining to do. Just then I heard footsteps – but before panic could take hold, a couple of other chaps appeared and adopted my own dress code. Thank you, God. Relief was short lived because my treatment, when it came, was more of a punishment. Administered by a hairy-knuckled Bulgarian weightlifter, it left me with purple bruises and a quiet determination not to repeat the experience. Ever. But Colleen is the persuasive sort (did I mention that?) and before long she’d booked us a couples massage in the Lotus Spa on Regal Princess. This time, to my relief, the process was more structured. The norm on cruise ships is that you show up for your appointment, head to a relaxation room and fill in a couple of medical forms before being called in for your treatment. “Well that was quite nice,” I said to myself, when reality reasserted itself later that day. “Though it’s not as if I’ll make a habit of it.” But I did. And now, as a seasoned spa-man, I slip on the robe and slippers in my stateroom and shamelessly pad my way towards heavenly bliss. You see, I actually enjoy my fellow passengers knowing what I’m up to. When the men edge away, as they sometimes do, I just think, “You don’t know what you’re missing”. And cruise ship spas offer much more than just massages, even for gents. You can go for a shave and a haircut, a manicure, a body scrub, or have yourself wrapped in any number of gooey-yet-soothing substances. Some spas even offer acupuncture, Botox and cellulite treatments. I tried a teeth-whitening service on a Princess Cruises sailing ‘That was nice,’ I said to myself. ‘Though it’s not as if I’ll make a habit of it.’ But I did”(I was Tom Cruise for a day, or at least until my first Diet Coke). Even if you don’t splurge on a treatment, you can still use the spa’s facilities. Most offer large rooms with heated ceramic loungers for relaxing and reading between dips in the thalassotherapy pool or hot tubs. Day passes are available, and at about £30 (or less if you invest in a full-cruise access pass) they can buy you some welcome respite from the chaos of the Lido Deck. 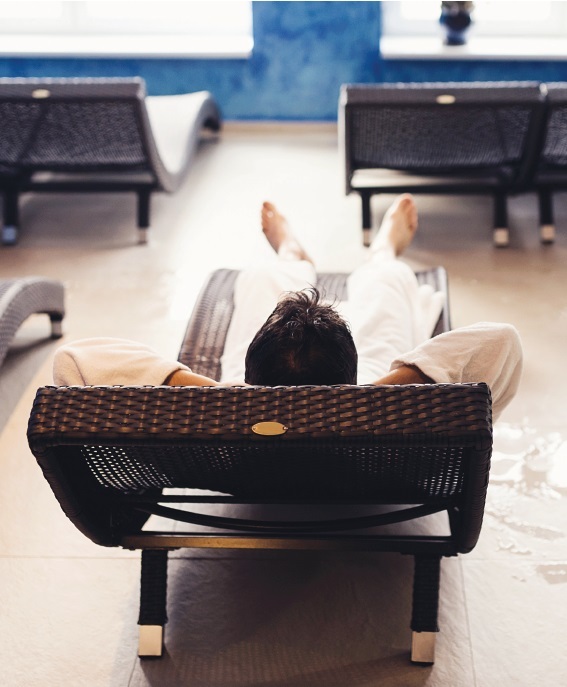 On Celebrity Cruises’ Infinity, I visited the spa and thermal relaxation area almost daily. I tried the Finnish sauna and the aromatic steam room. I soaked in the therapy hot tub after a workout in the gym. But mostly, I loved the chance to chill out on a lounger and admire the view as we slid through the Panama Canal. Viking Ocean cruise ships feature a thalassotherapy pool, Snow Grotto, saunas and even a cold-water bucket (you stand under it and pull the chain to douse yourself with near-freezing water). Access to the LivNordic spa is complimentary, so you can indulge your inner Norseman to your heart’s content. Nothing sissy about that, is there? If you still need a good excuse to book your first massage, try daily biking jaunts in the hills beside the Danube. I went with Backroads, an active travel company that has joined with AmaWaterways to offer an intense cycling hit during river cruises. My legs and back were starting to protest after a few days in the saddle until a sports massage aboard AmaSonata set them right again. But by this time I didn’t need a reason. 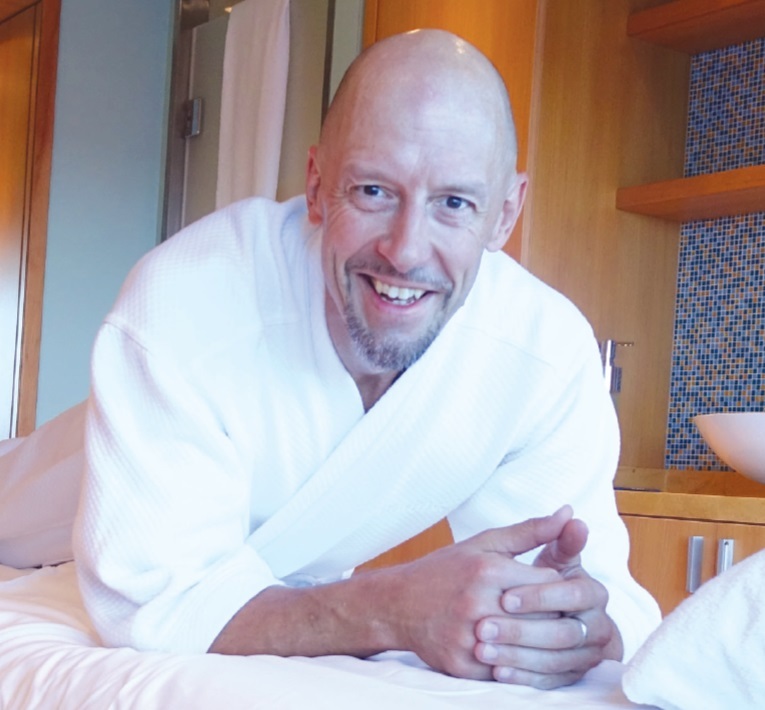 A few months later, on Carnival Vista, I was strutting in my white robe towards the Cloud 9 Spa for a coconut Thai poultice full-body service. Never tried one? You simply must. And you won’t be alone. Three out of every 10 clients at Cloud 9 Spa are now men, and our numbers are growing. As my massage therapist set about me with a pair of club-shaped paddles filled with heated coconut oil, I could feel the moisturizing benefits immediately. The Caribbean sun had taken its toll that week. And you have to look after yourself – don’t you? The Couples Villa is an incredible space to rekindle romance with your partner. My wife and I shared a blissful hour-long massage and were then left alone for time in the hot tub and steam showers after our treatment. It even offers customised music selections. Another couples massage. I chose the deep-tissue muscle treatment, which made me wince a bit. Silly me, I asked for hard pressure a day after lifting weights. The spa features the Greenhouse Retreat relaxation area with steam grottos, a sauna and a hydrotherapy pool with warm mineralised water. Coconut Thai poultice massage is a hybrid full-body massage and moisturising treatment. The massage hits all the same sweet spots but adds the benefits of the nourishing heated oils. I slept like a baby that night!